We just reached home two days ago from Chinese New Year celebration. Fortunately the traffic was smooth before it got worse in the afternoon. We decided to start the 360km road trip 6 in the morning to avoid the anticipated traffic congestion. We turned out making the right decision because the highway was jammed big time in the afternoon. Chinese New Year is one of the very rare moments when everyone is at home in my family home: my parents and three brothers. 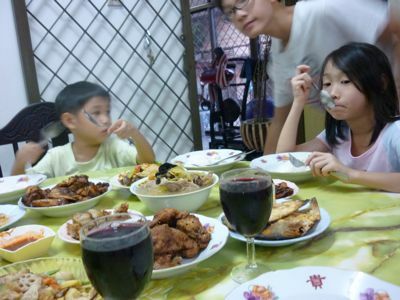 Until now, I never miss celebrating CNY with them. Though many have already opted to go for vacation during this long break, I prefer to go the traditional way by staying in my “old” home. It is only during this time that everyone (including old friends) is around – without the need for everyone to agree to a date when everybody is around. I always take this hard-to-find opportunity to let J and K mingle with their grandparents and uncles. Last year about the same time, I wrote about their relationships with their uncles. I was happy to see the improvement then. I know I mentioned it before, but I am going to say it again because the relationship with close family members is one of the most important things anyone can have. I was happy to see positive developments last year. I am even happier this year. The relationships between J and K and my brothers have improved leaps and bounds this time (though the relationships with my parents need more work). J and K wasted no time to play with my brothers when they met during CNY holidays. Prior to this, they needed some time to warm up before they could actually go all out to play with their uncles. But this time, they didn’t need that. They can just sit on their laps or watch TV together or joke around like never before. Not only that, J had spoken more words with her uncles compared to all the encounters in the past. She is more like herself now. She even teased her uncles. Of course, K followed suit. For an introvert girl like J, it’s quite a miracle considering the fact that they only meet their uncles only a few times a year. Probably 3-4 times except the 3rd uncle who is living in the same city as we do and whom we meet more often. I know 8 years is a long time to bring the relationships to what it is today. It is better late than never. Or worse I have witnessed some relationships get deteriorated over the years when the kids grow up. Definitely not something I want to see in my children’s relationship with their uncles. On the last night of our holidays, my wife introduced J and K to their cousins whom they never met – when they came to visit. Janice and Eunice are of the same age as J and K respectively. Eunice, the younger sister, is the most active and talkative of all. She is afraid of nothing. She can strike a conversation with just any stranger while her sister, Janice, who has totally opposite personality is a very introvert type of person. After getting to know them for a while, J and K started to play along with the two sisters. In the end, the quiet Janice also opened up and smiled while they were playing with a swing. 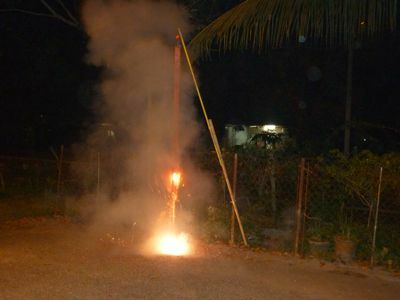 After so many years, it was the first time in their lives my children witnessed an 8-foot long firecrackers being ignited right in front of them… albeit the whole event lasted just a few seconds. 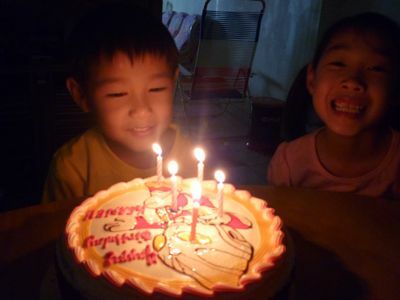 This time we took this opportunity to celebrate K’s 5th birthday with my parents – as his birthday coincided with this year’s CNY. It was a simple celebration with a birthday cake. I guess this is the first time my parents celebrated birthday with K.
Just like any other festivals, CNY is no different. The only thing we do is eat, eat, and eat some more. Of course, in between meals, we visit some friends and relatives. This year, we had two family reunion dinners. One with my in-laws on the day before New Year’s Eve. This was specially arranged as my in-laws were away during CNY. Another one with my family on New Year’s Eve. 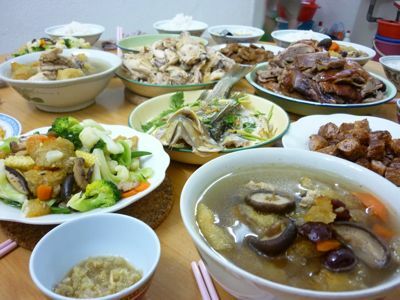 New Year’s Eve is the day when all family members, far and near, are back for reunion dinner with their parents. 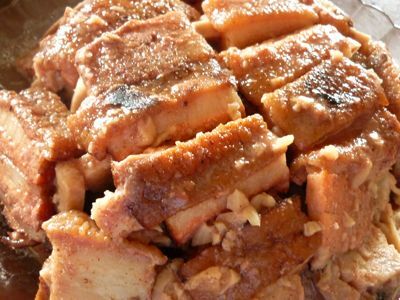 On the first day of Chinese New Year, as usual, we had lunch at my late grandfather’s house. Again, I talked about it in details in last year’s article. This is the only avenue where I can meet my uncles, aunts, cousins… all at the same time in one place. The holidays officially ended two days ago. We have to go back to work and the kids have to go back to school. Nonetheless, the 6-day holiday was fun and exciting.